Developed at the east end of Grand Avenue, adjacent to the new Wiseburn High School site, the Aquatic Center features a 53.2 meter, 10-lane competition pool, which will be home to the El Segundo High School and Wiseburn boys and girls varsity and junior varsity swim and water polo teams, mens and womens water polo teams, and local swim club teams, according to its website. The tentative opening date is Saturday, Sept. 8. 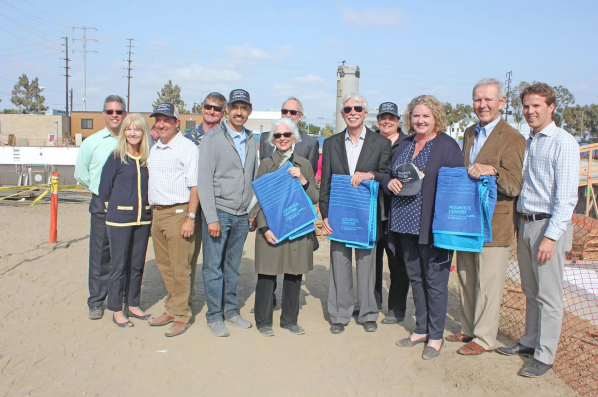 Richard Lundquist, donor and president of Continental Development Corporation as well as South Bay Sports, Health and Recreation, said they are months from “jumping in the pool,” but they are short $2.5 million of their $6 million goal for the development. “We can make this something great for the community and have regional events, fill the hotels, bring in more money to make other wonderful projects like this one,” said Lundquist at the event. “A lot of times making things come to fruition is harder than we think, but seeing it here today I hope it gets us all excited for opening day that they’re working hard towards,” said Emilee Layne, president of the El Segundo Unified School District. The new facility will feature seating for more than 500 spectators, a scoreboard and timing system, sports lighting and a PA system. There will also be a teaching and fitness pool as well as community swim lessons, fitness classes and other recreational programs. View the full article by The Beach Reporter here.